Building a fence around your property can have a significant impact on the comfort and livability of your property. Fencing can improve the look and feel of your landscape, and serve as financial and "curb-appeal" investments when it comes time to sell. Many homeowners are startled to learn the complexities of building a fence and are surprised at the choices available. This guide will break down the pros and cons of the top fence materials available to help you make a decision that fits your budget and needs. Wood is the best all-around material for fencing on the market. The wide availability of timber, reasonable cost, durability, and variety of colors and textures make wood the champion of modern residential fencing. A well-built, well-maintained cedar fence can last as long as 40 years, and pine or spruce fencing will last about 15-20 years. One of the significant weaknesses of this type of fencing is moisture. In-ground wood posts have prolonged contact with ground moisture, and only pressure treated wood should be used here. 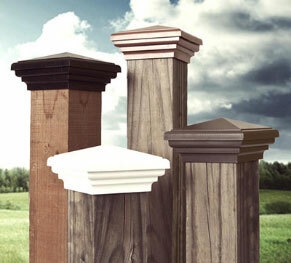 A great way to protect moisture from entering the top of your posts is to top it with a fence post cap! Wood is the bread and butter of fencing materials. Composite fence materials were developed in an attempt to combine the benefits of wood and vinyl into a single product. There is a staggering number of composite materials available on the market, all with unique characteristics. Some are manufactured with wood blended into the material, while others are made entirely out of recycled plastics. Most of these materials come backed by extensive warranties, which offers a small consolation for what is often a prohibitive cost. While composite fences and decks have a very long life span, they are not without issues. As mentioned before, the cost of composite building materials can be exceedingly high to purchase. A certified installer can easily double the price. Many of the original and most popular composite options are notoriously bad at retaining their color. A consumer searching for a vinyl fence option will have no trouble finding something that fits their landscape and aesthetic tastes. With the addition of a UV protectant, higher end vinyl fencing can last a very, very long time. On the other hand, vinyl is much more expensive upfront when compared to wood. It is also considered environmentally unfriendly, and the material typically isn't accepted at recycling centers. Vinyl fencing can also be surprisingly tricky to install, needing specialized fasteners or brackets. Often, the thinner and more brittle vinyl fencing needs to reinforcing with concrete or metal.